A collection of war medals was stolen from a house in Northampton. 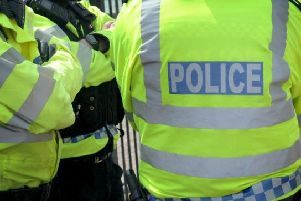 Thieves stole a motorcycle, quad bikes and various equipment at farms between Banbury and Southam last weekend. Warwickshire Police officers are visiting the farms to offer security advice, provide Smart Water and low cost alarms. A police spokesman said: “Police are urging anyone who owns a quad bike or motorbike to chain it to a solid anchor and if possible also keep it in a locked building. “Valuable tools should also be chained together and locked in a secure building. “Also consider visibly marking your items in paint with your post code to make them less attractive to thieves and easily identifiable. “Thieves are looking for easy pickings they can sell quickly and the more difficult you can make it for them the less likely they are to steal your belongings. “Finally, it is likely the thieves steal the quad bikes by putting them in or onto a trailer. • A green and white Kawasaki off road motorbike was stolen from outbuildings at Manor Farm, Napton, sometime between 10.30pm on Friday, April 20, and 9am on Saturday, April 21. A second outbuilding was also broken into and it is currently unknown if anything further was stolen. • Police are investigating a burglary at Hill Farm, Lower End, Priors Hardwick, that was reported at 9.20am on Saturday. Thieves are believed to have smashed a wooden rear door on a workshop and stolen a Stihl strimmer, Stihl chainsaw, Stihl pressure washer, all orange and white in colour. • Between midnight and 8am on Saturday, thieves broke into a workshop on Stoneton Moat Farm, Priors Hardwick, and stole a Stilh petrol driven leaf blower and a red coloured jerry can. • Sometime between 8.30pm on Sunday, April 22, and 7.30am on Monday, April 23, a matte black Suzuki King quad bike was also stolen from Stoneton Moat Farm. The quad bike has a wooden box on the front rack and back rack. • A red Honda quad bike with a tray on the front and hay rack at the rear was stolen from Chestnuts Farm in Byfield Road, Priors Marston, overnight between Sunday and Monday. The farmer believes the theft may have occurred at around 1am on Monday morning as her dog was barking. The quad bike has ‘Freeman’ painted on the side. • Police were called at 7am on Monday after it was discovered that a green Yamaha quad bike had been stolen overnight from Caudle Hill Farm, Burton Dassett. A Stihl chain saw was also stolen and a socket set. Any witnesses, or anyone who can help police with their enquiries to locate these items is asked to contact Warwickshire Police on 101.